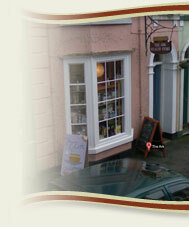 The Ark has been trading as an independent health food shop in Ashburton for over 30 years. The shop was originally run by Christine and Ken Wilkinson for 18 years before handing over to Christine and Symon Kennedy in 2001, who ran the shop for nearly 6 years. The business was then owned by Sarah and Shane who took over management of Fiona's online shop which has since become The Ark's website. As off the 1st April 2017, The Ark is now under ownership of Jenny and John Parnham who wish to keep the shop running as it has been for so many years.